Balls and strikes are the building blocks of baseball. The pitcher’s stuff, the way the catcher receives the ball and how the umpire sees itare just a few of the factors that comprise the strike zone. Ian Yorkexamines the always changing strike zone and the influence of ball-strike counts on subsequent calls. Baseball fans know that there is really no such thing as the strike zone; there are many different strike zones, with different shapes and sizes. There is the rulebook strike zone, which is what many people have in mind when they talk about “the strike zone”; but not only has the official zone been changed a dozen times since baseball started, no umpire has ever actually called the official zone anyway. There is a de facto strike zone, which is what umps actually call. Of course, that “strike zone” is really two strike zones, one for right-handers and another for left-handed hitters. 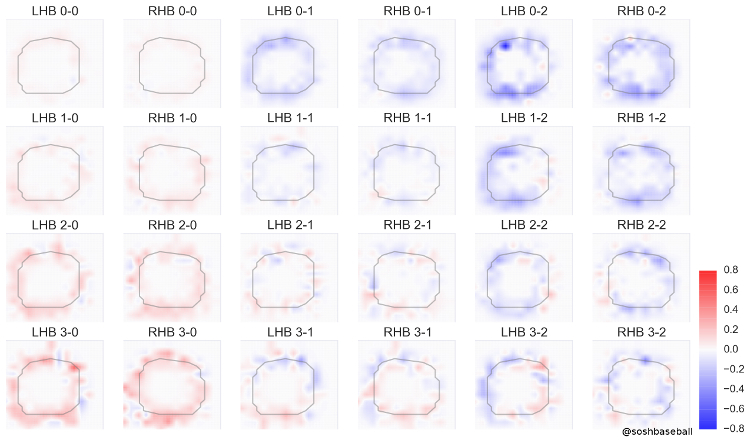 The strike zone is different shapes and sizes: Right-handed batters have a slightly larger zone than left-handed batters. But the de facto strike zone has changed significantly since the advent of PITCHf/x in 2008, when umpires started being evaluated on how well their call matched the actual location of the pitch. Since 2010 the zone has gradually expanded, year by year, so that the zone in 2014 is closer to the official zone’s shape and size than the 2008 zone was. Batter-handedness and PITCHf/x are not the only things that affect the strike zone. Catchers have varying ability to affect the size and shape of the zone. Catchers who are good at framing pitches can expand the zone – sometimes all around the zone, sometimes in one particular region – and catchers who are bad at framing can cause the zone to shrink. A team might see one strike zone for most of a series, then abruptly see a different zone when the backup catcher starts the series’ finale. On top of that, even though most umpires call a strike a strike and a ball a ball, there are several umpires whose personal strike zone is quite a bit larger or smaller than the average umpire. A team may see a different zone from one day to the next as new home-plate umpires rotate in. Changes to the strike zone take place at an even more discrete level than by umpire or catcher. In addition to the slow, year-to-year expansion of the de facto strike zone, the intra- and inter-series changes in catcher framing, and the daily changes in the umpire’s strike zone, the strike zone changes with almost every pitch, because umpires call a different zone for different ball/strike counts. Note: These strike zones are shown from the umpires’ viewpoint. 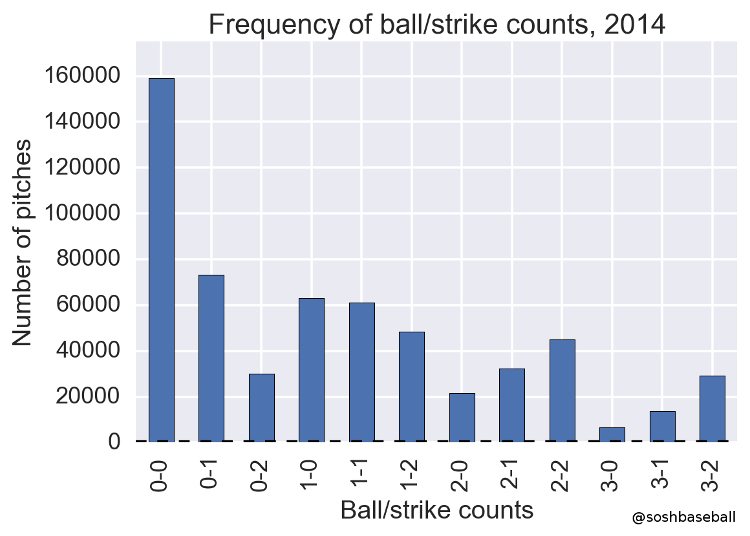 The PITCHf/x database was used to select called balls and strikes from 2014. 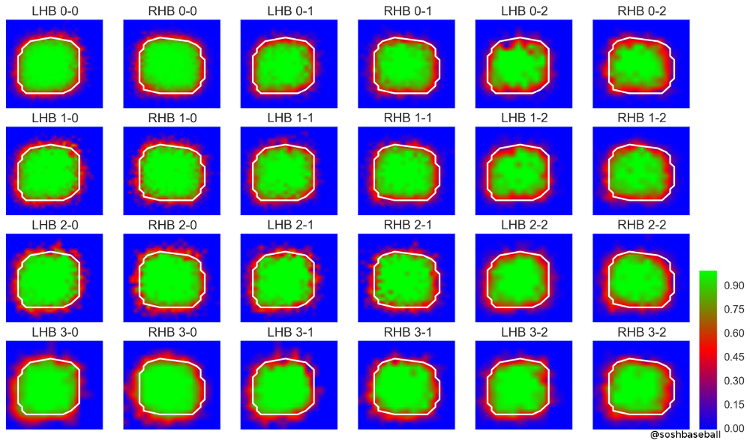 These plots show the probability of a pitch being called a strike in sub-regions in and around the plate for left- and right-handed batters. In blue areas, the pitch will almost always be called a ball; in green areas, it is almost always a strike. The red areas, where a pitch might be called either way, delimit the edges of the de facto strike zone. The white polygons show the 50% zone – outside the lines, a pitch is more likely to be a ball and inside it is more likely to be a strike. The 0–0 count, of course, is the most common (27.3% of all pitches), and the 3–0 count is the least common (just 1.1%). You can easily see that the strike zone changes size in some of the counts – the zone for 0–2 counts, for example, is clearly quite a bit smaller than the zone for 0–0 counts. The 0–0 counts are essentially neutral ‒ virtually identical to the overall average. At 0–2, the strike zone is much smaller; the edge of the normal strike zone is less likely to be called a strike. The umpires, consciously or unconsciously are helping out the batter and making him less likely to strike out. The same trend, though less blatant, is also there in other pitchers’ counts: 0–1, 1–2, and 2–2. Even at 1–1 and 3–2, the zone becomes slightly smaller than in the neutral 0–0 count. At 3–0, umpires do the opposite; they expand the zone significantly, making it easier to throw a strike and avoid walking the batter. Again, the same trend is there for other hitters’ counts; 2–0 and even 1–0 show a bit of zone expansion. None of this is new or surprising to anyone who follows the game; umpires have been doing this since they first started calling balls and strikes. It is something to consider whenever the annual plea for robots to call balls and strikes comes up. Whether it is objectively better to have exactly the same strike zone for every umpire, count, and catcher, it would be a radical departure from how the game has been played. Just as the PITCHf/x-driven expansion of the strike zone could be one of the factors in the profound reduction in offense baseball-wide since 2010, having a constant strike zone would certainly change baseball in drastic and unpredictable ways.